NASHVILLE, TN — Music City strums a slow, sad song, having lost a dedicated and brave police officer who drowned while trying to save a life late last week. 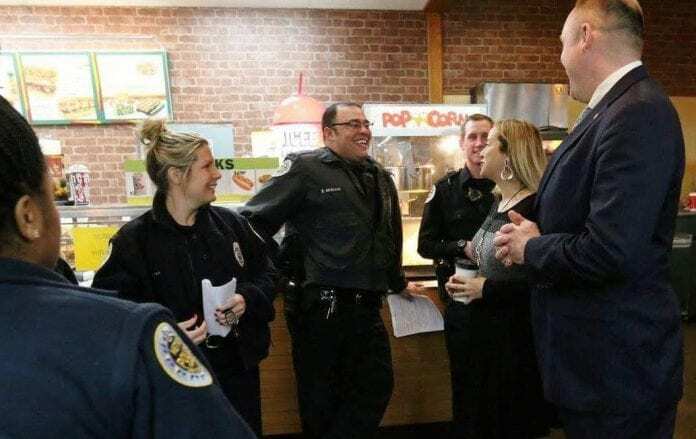 Metro Police Officer Eric Mumaw, an 18-year veteran of the force, “gave his life in service to his community in an effort to save the life of a woman in distress,” Mayor Megan Barry said that Thursday evening. “Like so many of our first responders, he rushed towards danger, instead of away from it,” Barry said. Many news departments reported the story. More than two hours before dawn Feb. 2, Mumaw and two other officers went to a 40-year-old woman in a car on a Cumberland River boat ramp, police said. Relatives had called saying she was suicidal. As it seemed she was to step from the car and go with police, the car’s transmission slipped into gear, police said. The car lurched forward into the river, taking the woman, Mumaw and Officer Nick Diamond with it. Diamond tried to save Mumaw, but could not. Officer Trent Craig, the third policeman, ran to the riverbank, saw Mumaw, attempted to rescue his fellow officer, but retreated from swift, frigid water. Next articleWill Metro Whitewash Diversity Audit?